The subwindows are sorted by the current WindowOrder. This is used for the subWindowList() and for activateNextSubWindow() and acivatePreviousSubWindow(). Also, it is used when cascading or tiling the windows with cascadeSubWindows() and tileSubWindows(). This enum describes the view mode of the area; i.e. how sub-windows will be displayed. 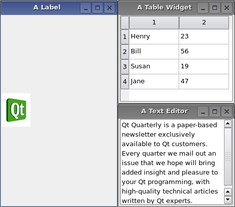 QMdiArea::SubWindowView 0 Display sub-windows with window frames (default). 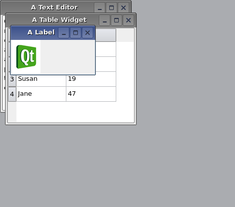 QMdiArea::TabbedView 1 Display sub-windows with tabs in a tab bar. Specifies the criteria to use for ordering the list of child windows returned by subWindowList(). The functions cascadeSubWindows() and tileSubWindows() follow this order when arranging the windows. QMdiArea::CreationOrder 0 The windows are returned in the order of their creation. QMdiArea::StackingOrder 1 The windows are returned in the order in which they are stacked, with the top-most window being last in the list. QMdiArea::ActivationHistoryOrder 2 The windows are returned in the order in which they were activated. This property holds the ordering criteria for subwindow lists. This property specifies the ordering criteria for the list of subwindows returned by subWindowList(). By default, it is the window creation order. This property holds whether the tab bar is set to document mode in tabbed view mode. Document mode is disabled by default. See also QTabBar::documentMode and setViewMode(). This property holds the position of the tabs in tabbed view mode. Possible values for this property are described by the QTabWidget::TabPosition enum. See also QTabWidget::TabPosition and setViewMode(). This property holds the shape of the tabs in tabbed view mode. See also QTabWidget::TabShape and setViewMode(). This property holds whether the tab bar should place close buttons on each tab in tabbed view mode. Tabs are not closable by default. See also QTabBar::tabsClosable and setViewMode(). This property holds whether the user can move the tabs within the tabbar area in tabbed view mode. Tabs are not movable by default. See also QTabBar::movable and setViewMode(). This property holds the way sub-windows are displayed in the QMdiArea. By default, the SubWindowView is used to display sub-windows. See also ViewMode, setTabShape(), and setTabPosition(). Gives the keyboard focus to another window in the list of child windows. The window activated will be the next one determined by the current activation order. See also activatePreviousSubWindow() and QMdiArea::WindowOrder. Gives the keyboard focus to another window in the list of child windows. The window activated will be the previous one determined by the current activation order. See also activateNextSubWindow() and QMdiArea::WindowOrder. Removes widget from the MDI area. The widget must be either a QMdiSubWindow or a widget that is the internal widget of a subwindow. Note widget is never actually deleted by QMdiArea. If a QMdiSubWindow is passed in its parent is set to 0 and it is removed, but if an internal widget is passed in the child widget is set to 0 but the QMdiSubWindow is not removed. Этот слот вызывается QAbstractScrollArea после вызова setViewport(). Reimplement this function in a subclass of QMdiArea to initialize the new viewport before it is used. Returns a list of all subwindows in the MDI area. If order is CreationOrder (the default), the windows are sorted in the order in which they were inserted into the workspace. If order is StackingOrder, the windows are listed in their stacking order, with the topmost window as the last item in the list. If order is ActivationHistoryOrder, the windows are listed according to their recent activation history.